When do I need to use the Type 2 Adapter for circumaural earphones? You need the AEC201-2 Type 2 adaptor for circumaural earphones only for KOSS HV/1A type earphones. 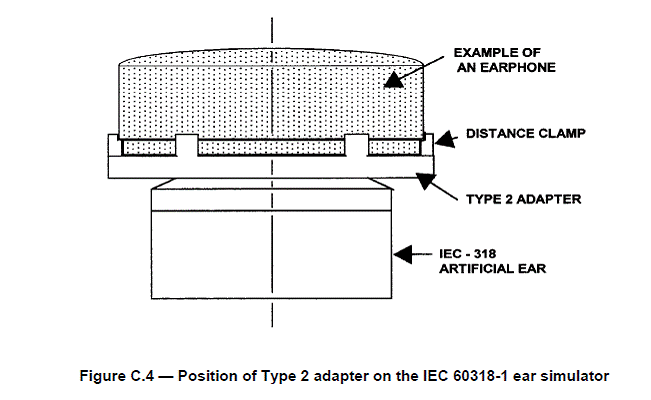 The Type-2 adapter is the flat crenellated adapter plate converting the Acoustic Coupler for use with Circumaural Earphones. This adapter is mentioned in ANSI S3.6 (2010) and in ISO 389-5 for use with the KOSS HV/1A earphones. How do I combine Model 831 and DNA for RT60 measurements? There are in principle two ways to use DNA for RT60. Both options require the DNA option for building acoustics, SWW-DNA-BA, and Model 831 driver, SWW-DNA-831. Both methods will give you access to the RT60 display / menu, shown below. - View RT20, RT30, or RT15 data. - Make and store an RT60 measurement on the Model 831. - Start DNA, connect to the 831, (Analyzer, 831, then click the connect icon). Close the Download files window after the file is downloaded. You could also load a previously stored slmdl file in the next step. 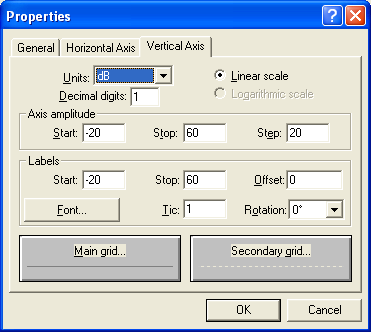 Click RT60 Measurement, select RT60 Mode, check Load measurement from a .r .slmdl file, click OK, select file, then click open. 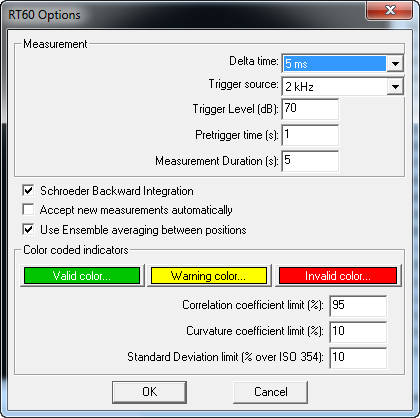 - In the RT60 window, select Options, and put a checkmark in Schroeder Backward Integration and Use Ensemble averaging between positions, then click OK.
- You can save the data in an RTdat file (RT60 Measurement -> Save as from the main menu) and reload later. 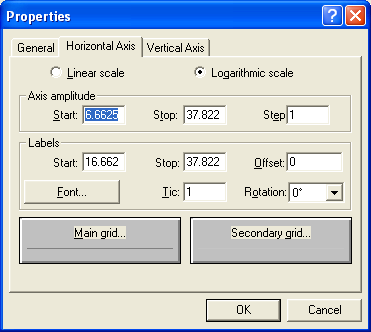 - Click Export to doc, select if you want to export all decays, click OK, then you can include your measurement info and click OK. The data will be translated to the DNA document window. NOTE: You can switch the 831 from RT60 mode to SLM mode using the DNA DirectScreen option in the View drop-down menu. It is recommended to disconnect and reconnect the 831. - The Run/Stop acts as position increment just like Start/Stop does on 831. 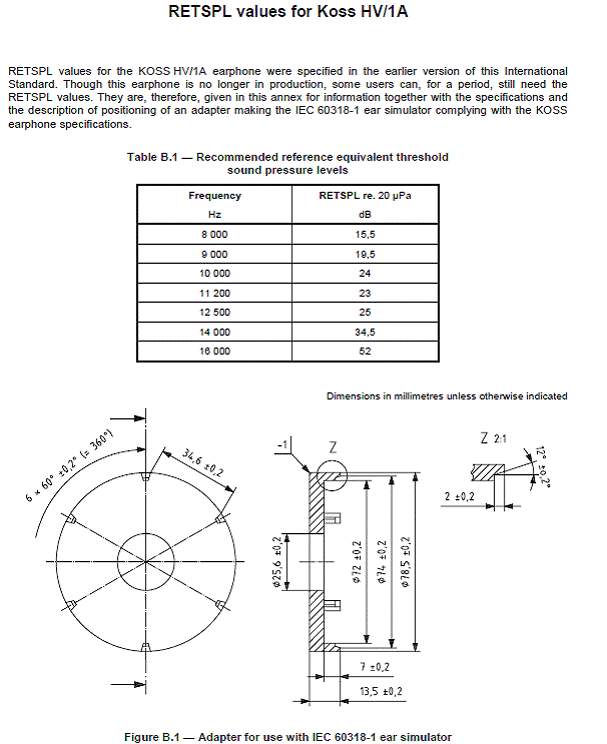 How does the RT60 implementation on the Model 831 differ from the 824? 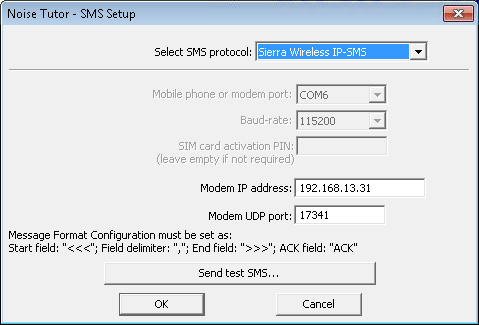 How do I setup Sierra Wireless LS300 for sending SMS with NoiseTutor? 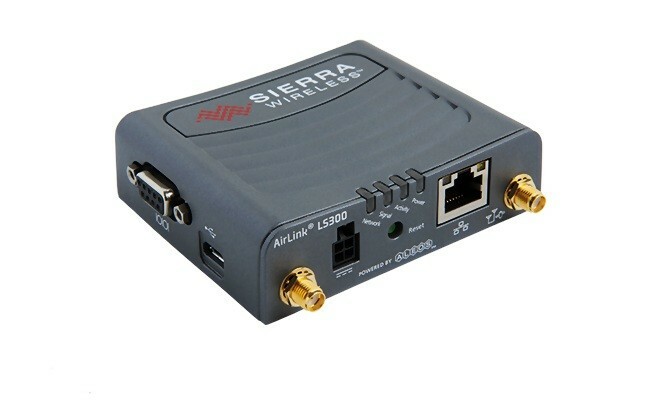 The Sierra Wireless LS300 is a new model wireless gateway designed to replace the Raven product line and support 4G data. 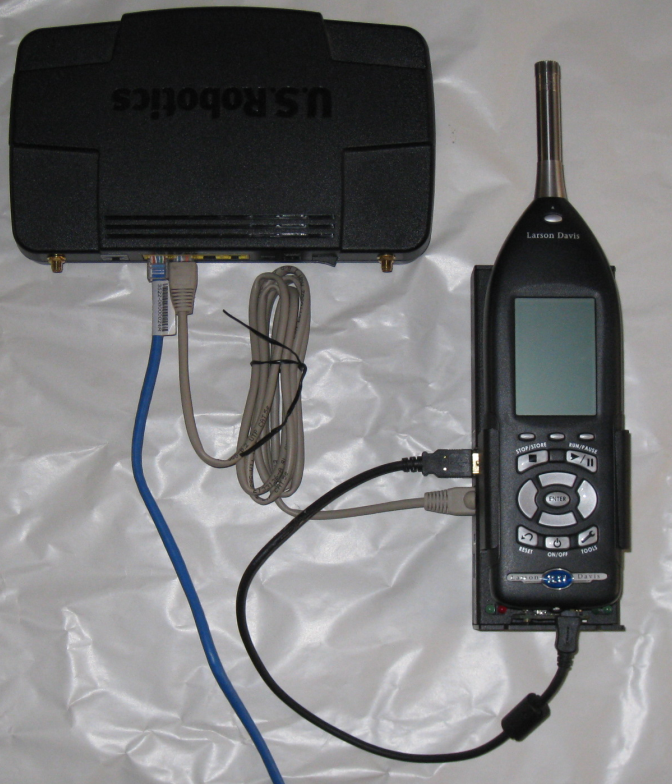 The LS300 is used inside the NoiseTutor system to provide a wireless data connection and SMS messaging. 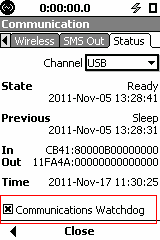 For data service the factory default settings are typically adequate although for SMS messaging to work, some configuration of the LS300 is necessary. The LS300 has a built-in web page called AceManager that is used to configure the device and detailed instructions for accessing and using AceManager are included in the LS300 User Manual. This document provides an overview of the necessary steps. 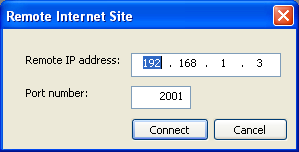 2) Open a web browser and enter http://192.168.13.31:9191 in the address bar and the login screen should appear. If you don’t see the login screen, reboot the PC and repeat this step. 4) Most cellular service providers require an Access Point Name, APN, be configured for the system to work properly. 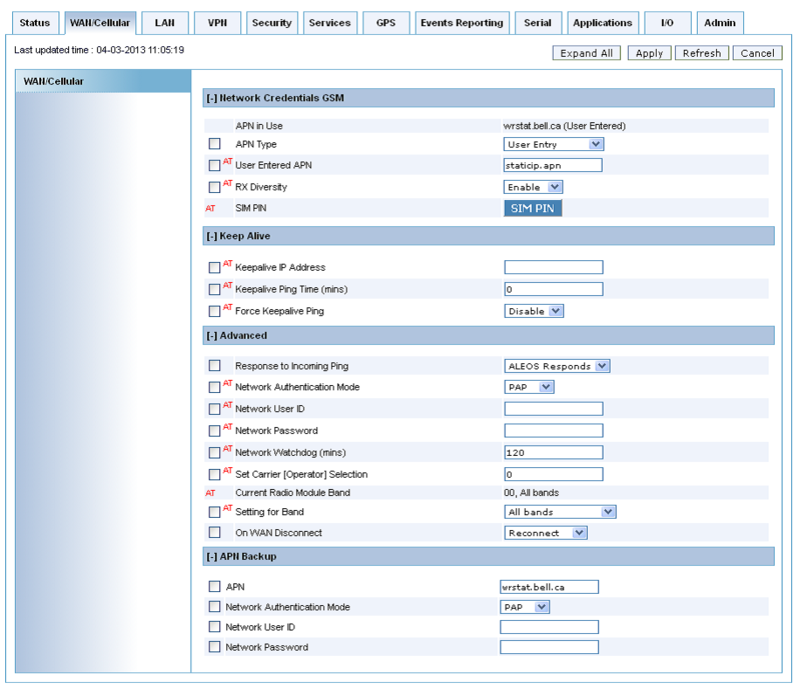 When an APN is needed but not entered, they LS300 will not be able to access the internet. 6) NoiseTutor is now configured to send SMS messages. 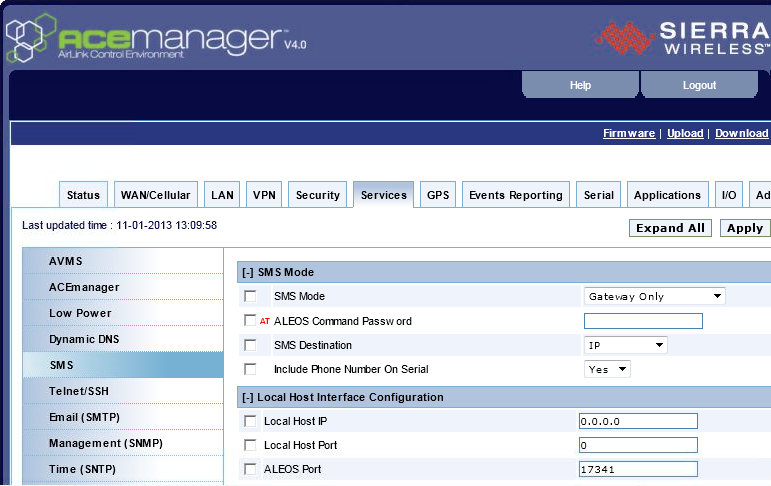 Go to Setup > Event Detection > Event to configure an SMS message when an event has occurred. How do I connect the 426A12 outdoor microphone to a Model 820, 824, or 870 sound level meter? The 426A12 can output signals that could potentially damage the input circuitry of the 820, 824 or 870 sound level meter. To correctly interface these SLM’s to the 426A12 use the additional equipment listed in Table 1. See Figure 1 and Table 2 for additional information on the connections. 1Connecting additional preamp and ADP006 directly into SLM signal connector may be too tall for NMS box. Using CBL078 or CBL092 short extension cable makes the connections possible and also allows fit inside NMS box. 2 Cable has default length of 20 feet. Custom lengths are also available. 3 If 426A12 is directly replacing a PRM2100K or PRM2101K a 426A12-NPT adaptor pipe coupler will be required. 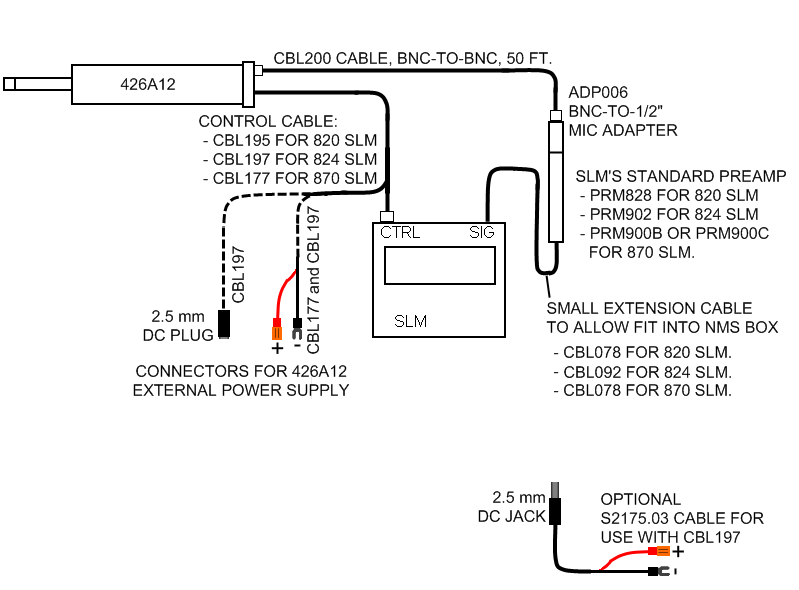 4 An optional adapter cable, S2175.03, is available to connect the CBL197 control cable to a Larson Davis outdoor monitoring system that has a power and ground block system (see Figure 1 for additional information). Will the 426A12 mount directly to an existing pole that previously had a PRM2100K or PRM2101K mounted to it? The PRM2100K and PRM2101K both use a 1.5”-11.5 NPT mounting thread, whereas the 426A12 uses an ISO 228-1 G 1.5” mounting thread. The 426A12-NPT adapter pipe coupler is available to convert the 1.5” NPT to the required ISO 228-1 G 1.5” thread, allowing the mounting of the 426A12 to the original pole. What 426A12 features are available when used with the Model 820, 824, or 870 SLM? Selectable weighted filters: A, C, or Z weight. Selectable microphone polarization: 0 or 200 volts. Selectable gain: 0 or 20 dB. Electrostatic actuator for calibration check. Microphone humidity control using desiccant cartridges with visible indicators through window. 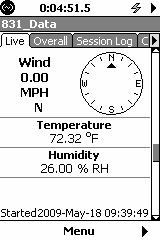 Reading the 426A12 internal temperature and humidity sensors (through serial communications). Reading the 426A12 model and serial number electronically (TEDS). How does the additional in-line preamp affect the performance of the system? The additional in-line microphone preamplifier (PMR828, PRM902, or PRM900) does slightly change the dynamic range and noise floor relative to the original outdoor system. 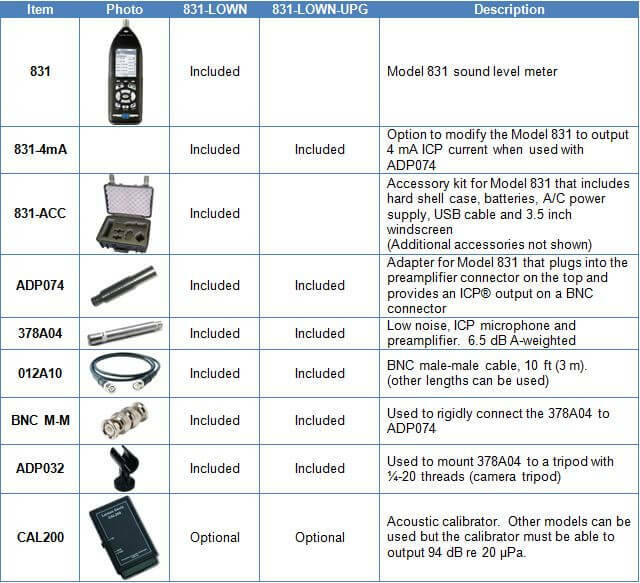 Listed below are typical results, comparing the PRM2100K and PRM2101K outdoor microphone preamplifiers to the 426A12 configured with the additional equipment listed in Table 1. All of the test are performed with a 12 pF equivalent microphone capacitance at the front end of the outdoor microphone preamplifier. The ADP006 (47 pF) adapter at the input of the PRM828, PRM902, or PRM900 has negligible effect to the noise floor and frequency response of the system. 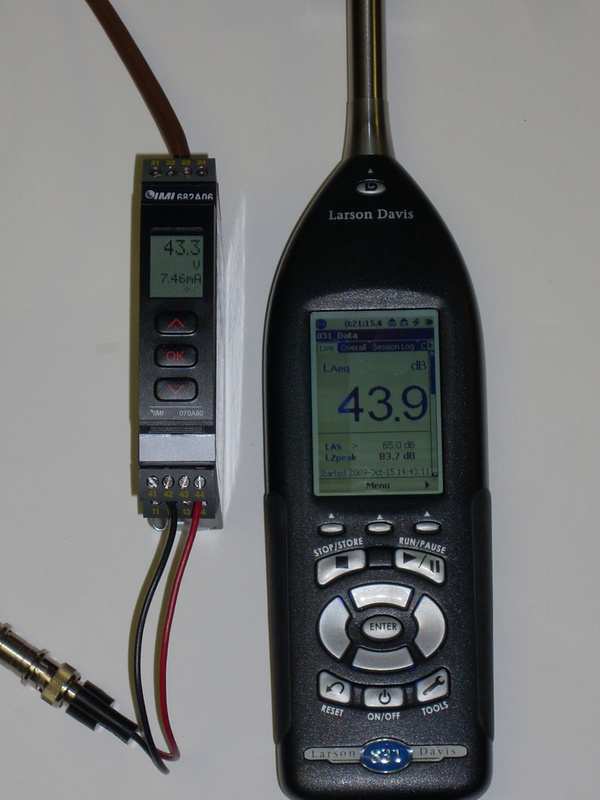 What Precautions should I take when using external DC power with my sound level meter? The Model 831 includes many input power protections to help avoid damaging the instrument. B) When using USB current limit protection is provided by the USB port supplying power, i.e. PC, hub or PSA029. Internal to the Model 831 all grounds are electrically connected and there are no fuses or other protection against externally induced ground current. It is therefore important that all 831 ground points remain at the same voltage. Failure to keep the ground voltage consistent can result in electrical currents that can permanently damage the Model 831. A voltage differential can be created by a variety of situations and listed below are a few. 1) The exterior of the preamplifier, microphone or cable connector comes in contact with an unprotected power supply such as the positive terminal of a battery. 2) The shield of a USB cable that is connected to the 831 comes in contact with an unprotected external power supply. A) Make sure all power connections are covered by an electrically insulating material. 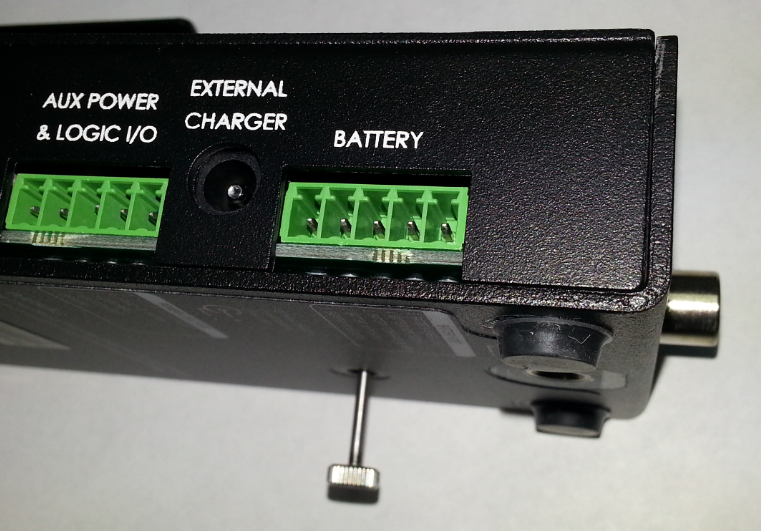 This includes the terminals of any external 12V batteries which should have terminal covers securely installed that cover all conductive portions of the terminal and connector. C) Use a 4 ampere fast blow fuse in both the positive and negative terminals of any external power cables. What is the difference between the 831-INT and 831-INT-ET? 1 What is the difference between the 831-INT and 831-INT-ET? 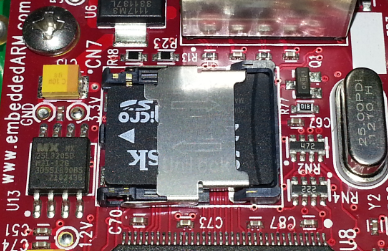 · Embedded Single Board Computer (SBC). · Single RJ45 Ethernet connector. · Additional USB Ports A and B (as part of SBC). Connect USB Port B to the 831 SLM’s USB port. · Ethernet connection enables faster connection speeds, real-time streaming of data, and also remote firmware upgrade. For more information please refer to the I831.04 831-INT/831-INT-ET Technical Reference Manual. 2 What are the differences between the various revisions? Differences between the various revisions of the 831-INT/831-INT-ET are listed below in Table 1. Features not listed in the table are common to all versions. 1 The system will power off when the battery voltage falls to the external power shut-off voltage as set in the Model 831 (default=10.8 volts), and will power up when the battery voltage returns to 11.6 - 12.3 volts. 2 The system will power off when the battery voltage falls to the external power shut-off voltage as set in the Model 831 (default=10.8 volts), and will power up when the battery voltage returns to 12.5 volts for at least 2 minutes. 3 The system status LED has enhanced functionality. The 831-INT(-ET) has been enhanced to provide improved protection to vulnerable Flash Memory chips along with the addition of other feature. To take full advantage of the new 831-INT-ET features, use Model 831 firmware V2.2 or later. 4 What is required to replace an 831-INT rev A in an EPS031 or EPS032 system with a later revision? M831.56 – NMS Rotating Bracket. M831.57 – NMS Stationary Bracket. Replacing these brackets in an EPS031/EPS032 system involves removing all the equipment from the box to gain access to the back plane of the EPS031/EPS032. It’s estimated this procedure will take 30 to 60 minutes to perform. The above procedure is not necessary for newer EPS031/EPS032 systems as they already come with the modified M831.56 and M831.57 brackets installed. 5 Is my 831-INT rev A or 831-INT/831-INT-ET rev B repairable? If an 831-INT rev A or 831-INT/831-INT-ET rev B cannot be repaired the entire unit will be replaced using later revision product. If a revision A 831-INT is replaced, the M831.56 and M831.57 brackets will also require replacement if used in the system. If a revision B 831-INT(-ET) is replaced, then only the M831.56 rotating bracket may need to be replaced. 6 How do I upgrade firmware in an 831-INT-ET? d. After removing the top cover, the U-shaped metal piece will lift off over the connectors exposing the circuit board. Use proper grounding techniques to avoid static discharge to the circuit board or any component on the board. Static discharge can cause permanent damage. f. Remove the old chip and insert the new chip in the lid, push down the lid and slide forward to lock the chip. c. 831-INT-ET firmware version 2.2 or later then SLM Utility G3 can be used to load new firmware. How do I connect to a 831-INT-ET with wired Ethernet? 1. In order to avoid conflict with existing other networks, please ensure the wireless LAN on your PC is DISABLED. a) Place the 831 in the 831-INT-ET cradle and secure with the screw. b) Connect the 831 USB cable to the 831-INT-ET “USB B” port. c) Connect the LAN cable from the 831-INT-ET “Ethernet” port to port 2 on the router. e) Wait about 3 minutes to be sure that the 831-INT-ET is booted, has started a communication with the router and with the 831. The SLM Uitlity-G3 program will quickly locate the 831 because of the shortness of the cables. d) You are connected to the Model 831 via the Model 831-INT-ET Docking Station and the router. The AC adapters are not shown. The BLUE CAT5 cable goes to the PC (PC not shown). What does the communications watchdog in the 831-INT-ET do? The Model 831 and 831-INT-ET have features to monitor the USB communication between the two devices and if there is no communication for one hour, the Model 831 and 831-INT-ET will automatically power cycle. When an 831 matching the requirements above is placed into an 831-INT-ET, the 831-INT-ET automatically sends a command to the 831 that enables the communication watchdog. When an 831 is removed from the 831-INT-ET, the communication watchdog remains enabled but becomes inactive. To disable the watchdog, go to Tools -> Communication -> Status and uncheck Communications Watchdog at the bottom. If the communications watchdog triggers a power cycle, the system will turn completely off and in approximately 1-2 minutes turn back on. A communications watchdog event produces records in the 831 Session log that show a stop due to IO and a run approximate 1-2 minutes later. WARNING: The 831 does not differentiate between an 831-INT and 831-INT-ET. If an 831 has been placed in an 831-INT-ET and then later removed and placed in an 831-INT, the communication watchdog must be manually disabled. Failure to do this will cause the 831 to turn off after one hour. For additional information, see 831 Manual page 12-24. What are the basics for setting up the Model 831 Dynamic Trigger? - LEVEL – this is straightforward, simply the level at which an event is triggered. 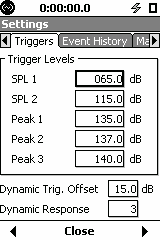 The trigger is defined at the first level reached of RMS (SPL 1) and peak (Peak 1) value. - DYNAMIC – unique feature of Model 831.
at midnight, it would be annoyance. Since the dog hasn’t gotten any louder, applying the same level trigger for the entire 24-hour measurement would not yield useful data. 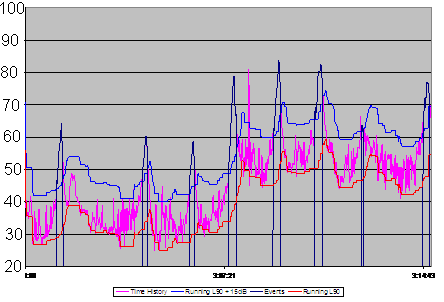 The plot above right shows a standard trigger situation. 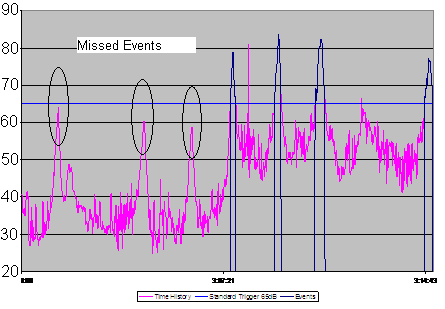 As you can see, some events were missed due to being below the trigger level. This is where the dynamic trigger comes in handy. By tracking the background noise level or L90 (level exceeded 90% of the time, shown in red) and adding an offset to it (15 dB offset shown in blue) we can determine better when an event occurs. A very useful feature for unattended monitoring applications. To select the setting number, start by using the default setting (3). 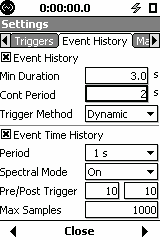 If you find that you’re missing events because the trigger level went up too much during an event, then make it slower and see if triggering is improved. If you find that you’re getting false events because the background levels are changing too fast, then make it faster so that the 831 is more responsive to changes in background level. 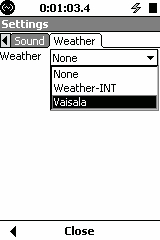 How do I use the Vaisala WXT520 with the Model 831? 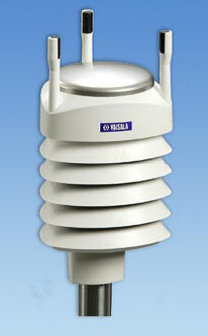 Next to the legacy models, we now introduce a combined weather sensor, SEN031, with ultrasonic wind sensor. 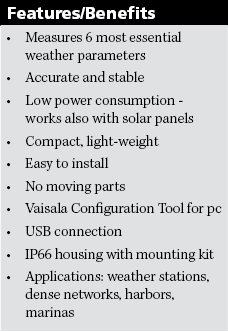 The picture and features / benefits come straight from the Vaisala brochure. 3) DC Power cable socket – WXT520 heater (5-32V) connects to optional PSA027 power supply. If heater is not wanted to save power it can be left unconnected. The 831-INT can’t deliver the 1.1A @ 12V = 13 W, hence the optional PSA027 power supply connection. We suggest configuring the heater only with AC powered systems. The SEN031 mounts on TRP019 using the TRP008 and on TRP020 using the TRP021. 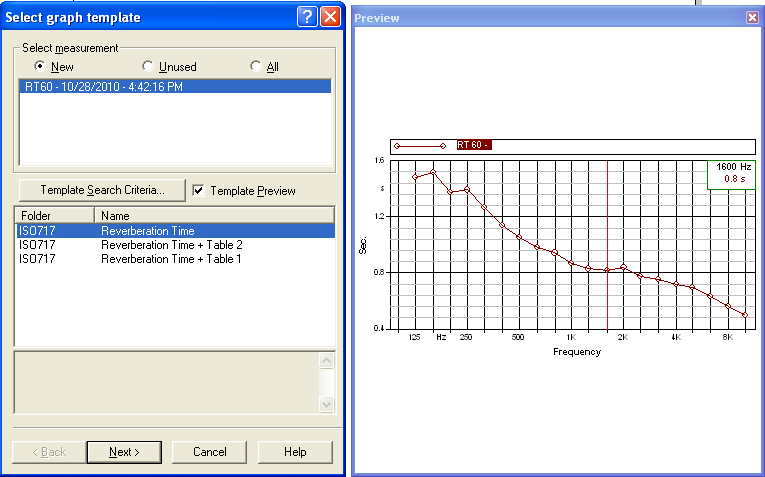 The table below shows which parameters are saved in the file, “Current” is saved in the Measurement History. How do I access the extra signals on a Model 831 without 831-INT Docking Station? 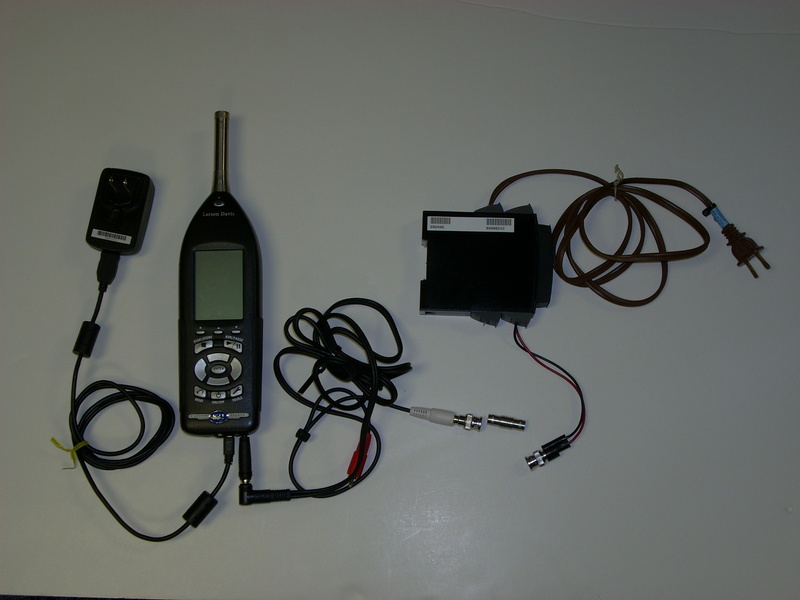 Cable connecting the Model 831 sound level meter to serial connector and coaxial DC connector (to PSA027). Serial connector: wind speed and direction, logic I/O, 2 slow ADC. The high density connector (Hirose 18-pin) goes into the Model 831. The power is supplied via the coaxial DC connector (2.5 mm), eg with PSA027. The cable with male DB9 and pigtails and male DB9 breakout board with screw terminals are there for convenience. The logic-in is not latching and is sampled by the microprocessor so for the trigger to be reliably detected, the pulse needs to remain high until sampled; at least 100ms. How do I calibrate a Model 831 or LxT that has a 1/4" microphone? When using the SoundTrack LxT or Model 831 with a ¼” pressure microphone (377B10) you also need a ½” to ¼” adaptor for the preamplifier (ADP043) and another one for the CAL200 calibrator (ADP024). Note: Part numbers and firmware revisions are subject to change. Please contact Larson Davis for current part numbers and firmware revisions. The recommended preamplifiers are the PRMLXT1 for the LxT and the PRM831 for the 831. The TOOLS – CALIBRATION section has different screens: Calibrate, History, Sensitivity, Certification and (in the 831 only) an E.A. Check screen and an E.A. History screen. In the sensitivity screen you select the 377B10. After calibration you will see the screens as shown on the LxT (left) and the 831 (right). The peak overload level is the maximum level at the preamplifier that will produce an electrical overload. 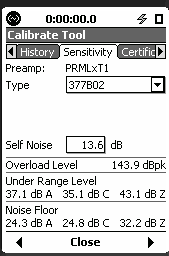 This level may exceed the maximum sound pressure level the chosen microphone is capable of measuring. Please consult the microphone data sheet for the maximum level for your microphone. 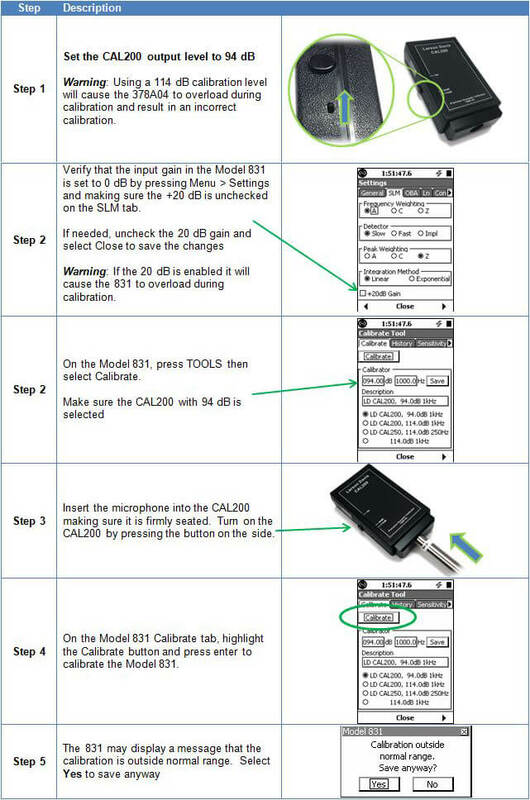 The sequence below shows how to move from the ½” microphone to the ¼” microphone, during the calibration. Sequence of screens (LxT) when changing from ½” free-field microphone (377B02) to a ¼” pressure microphone (377B10). The Calibration outside normal range message may or may not appear depending on the nominal sensitivity (user selectable in the 831). Refer to the manual where the valid range is shown. This warning is intended and allows to detect a larger than normal change. There is no problem in accepting the change. (If you recalibrate with a 50mV/Pa microphone, your reference will be again the old one). How do I use the Reference Curve Editor in DNA? 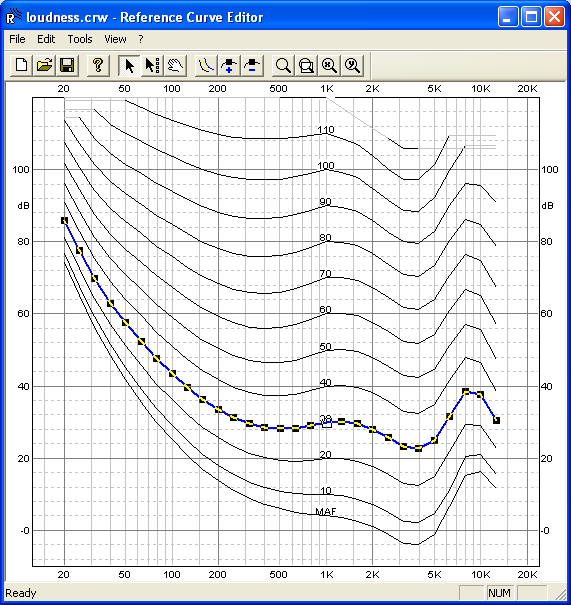 equal loudness curves, see below. DNA stores the reference curves in the DNA4/Weight directory as “CRW” files. 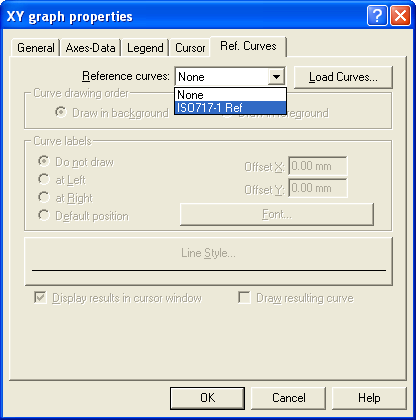 The files are defined using the Reference Curve editor from DNA (DNA4/RefCrv.exe) and placed on the graphs using the “Ref Curve” tab of the graph properties. 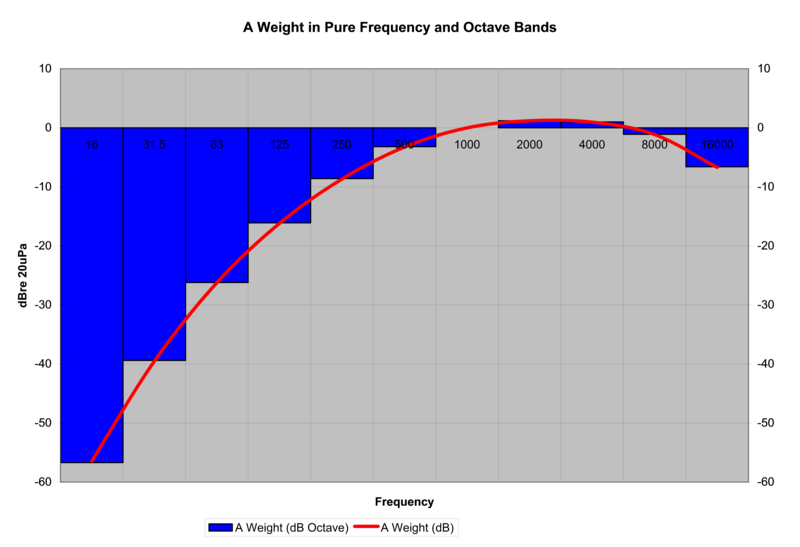 One curve is the reference, the others are derived from it. 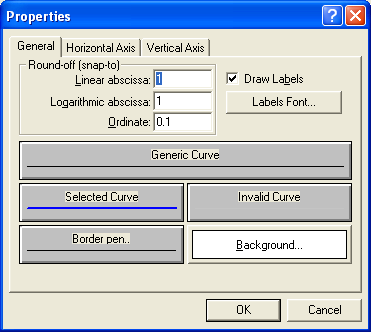 Selection » Select a point or a curve, black point indicates the curve is selected, empty larger square indicates the X value is selected. 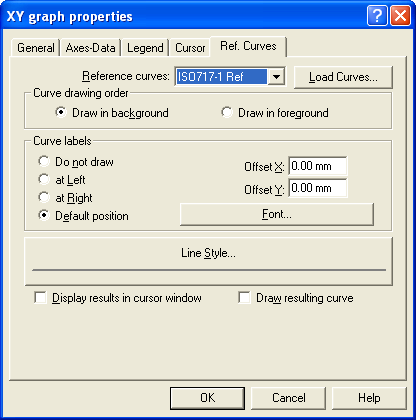 Add curve – allows you to add a curve parallel to the selected one, by clicking on the graph to attach it to a point. This continues until you select another button. The standard MS Windows commands or those already mentioned as icons are not discussed here. Select All » selects all points on a curve. Use this to move the complete curve. 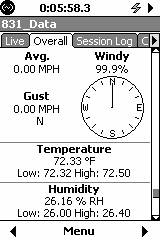 Edit numbers » edit numbers on each curve as well as the reference value. X Axis Lin. <-> Log. 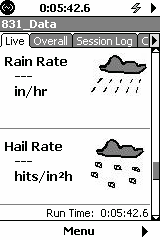 » Toggles between linear and logarithmic X axis. It is recommended to do this before you start. This allows you to enter the Label (make sure to press ENTER or the value is not registered) and the Ref value. 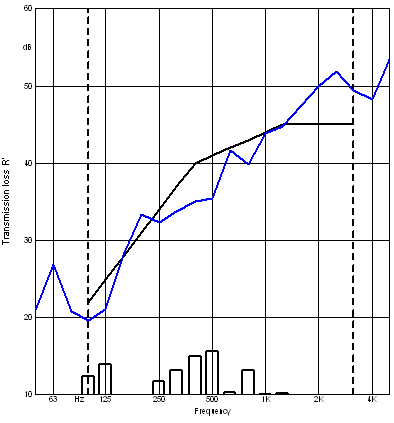 If you click on a point on the graph or on the frequency arrows you will see the right screen. This does not allow you to change the values. About the reference, you need to have all the values either in increasing order (top to bottom) or in decreasing order (reverse). The graph on the left has no reference curve, while the one below has the reference curve added. 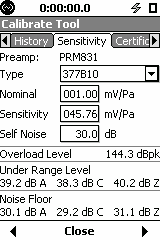 Can I have a 4-20mA output from the sound level meter? Using the AC/DC out from the Model 831 or SoundTrack LxT you can convert the DC signal to a 4-20mA signal using the IMI 682A06 Universal Transmitter, with optional display 070A80. 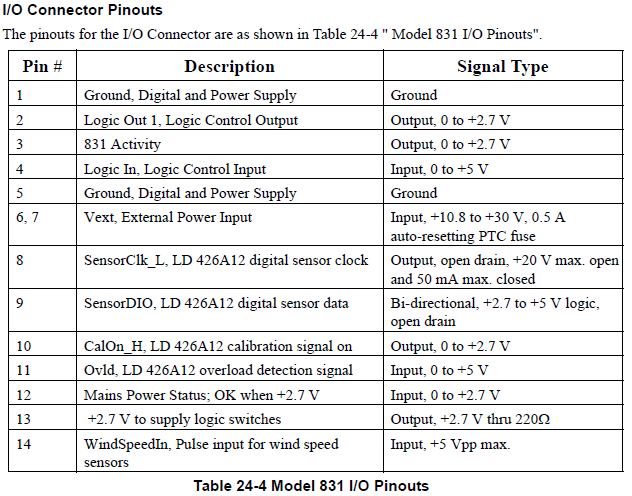 Ports 13 and 14 have output signal. The 682A06 allows for a 2-point calibration, via the ADV SET » CAL » CAL LO / CAL HI / USE CAL screens. How does QC Tonality work and what are “Corrected dBA”? 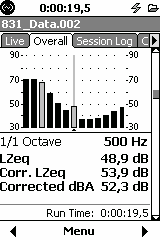 In the example displayed above there are two bands with a correction, 31.5 Hz and 500 Hz, which are both greyed out. Note for the 31.5 Hz it only looks at the 63 Hz band and not at the 16 Hz since it is outside of the analysis band. What firmware options and accessories will my Model 831 support? Timers power on 831 – A feature that allows daily timers to automatically turn on the Model 831 power just prior to the set start time. 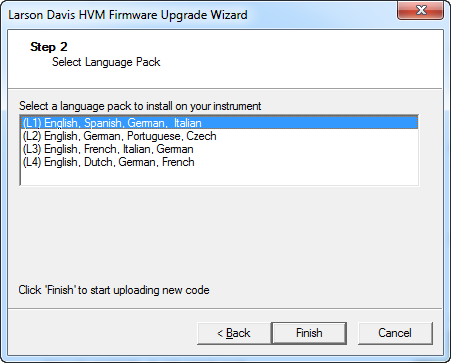 How do I update the firmware in my model 824 sound level meter? information listed in the footer of this page. 1. Power down the computer and the 824. 2. Connect an available RS-232 serial port on the PC to the 824 via CBL006 cable. 3. Turn the computer on, then the 824. 4. On the 824, press Setup, select SLM ISM, then press the checkmark. 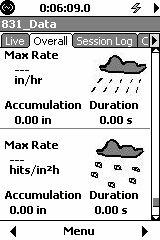 Then press TOOLS, and select Communication, then press the checkmark, and set the baud rate to 9600. 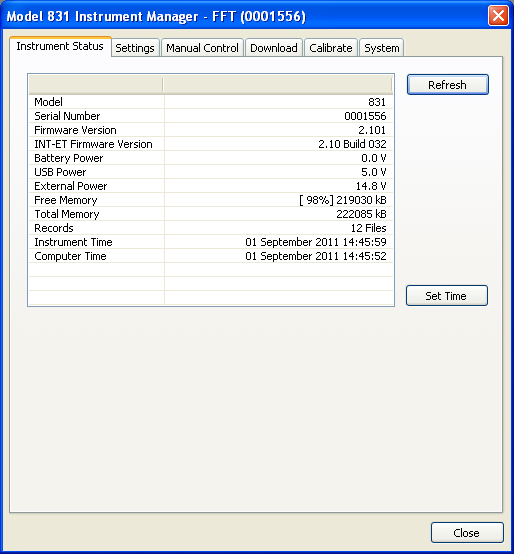 5) .Start the 824-Utility software v3.12 on your PC. Connect or press the tool bar icon. 2. 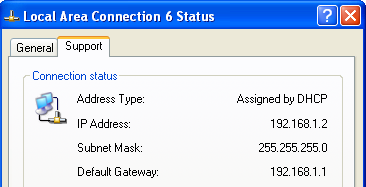 Enter the COM port, and 9600 Baud Rate of your 824. Press Connect. Upgrade…,then browse to your 824-xxxx.ldk file. 2 above. The Apply Options function will only take a few seconds. 3222 if you have any questions regarding your upgrade. If my 824 shows Analog Cal Bad, how do I restore the Analog Cal values? A change of internal 824 memory may cause the message ‘Analog Cal Bad’ to appear. The ‘analog cal bad’ can usually be field reprogrammed in the model 824. 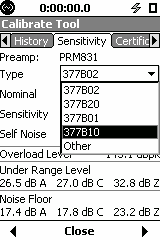 Internal to the 824 are stored values in EEPROM memory to digitally correct any slight calibration offset errors (typically less than 0.2dB) in the SLM ISM option for the full 110dB dynamic range. If the stored values no longer match the checksum, the 'Analog Cal Bad’ message is displayed. Call the factory Technical Support 888-258-3222 in the US or, 716-926-8243 international, with your 824 serial number to receive the necessary calibration file by email. 1) Copy the attached file .CBK to your 824Util (v 3.12) software folder on your PC. 6) After completion of reprogramming, do a microphone SPL calibration, and then store to EEPROM using TOOLS, MEMORY, Create EEPROM Backup. 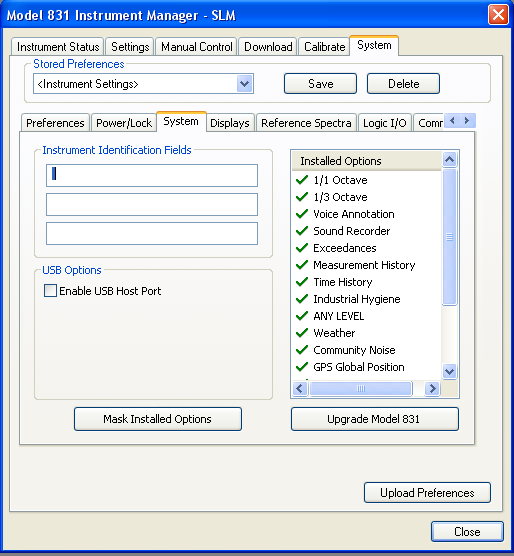 How do I Install new firmware and/or options on Model 831, SoundTrack LxT®, SoundExpert LXT and 831-INT-ET? Please follow the instructions below to upgrade firmware and/or options on Model 831, SoundTrack LXT® or SoundExpert LXT. 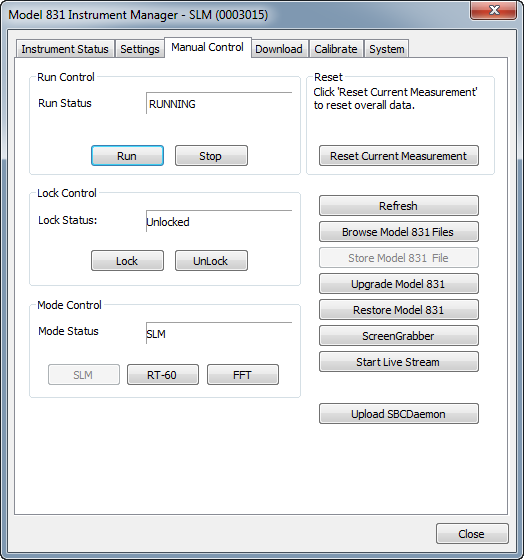 for the Model 831 or /Support/SoundLevelMeterSupport/LxTSoundLevelMeters for the SoundTrack LXT® or SoundExpert LXT and download the most recent version of SLM Utility-G4. Download the G4_Installer_x64.exe for a 64 bit operating system, or G4_Installer x32.exe for a 32 bit operating system (to check to see what operating system you have, go to Start, Control Panel, System). Note: Make sure you have full admin rights before starting the installation process, otherwise the drivers will not install correctly. 2. Download and save the file to your computer. Note: If the path to the file is longer than 128 characters the Windows operating system may generate an error. You will have to move the zip file to a location with a shorter path name. 3. Disconnect any Model 831 or LxT that is connected to the PC. 4. After the file is saved, find the zip folder (on the location you chose on step 2) and right click to select “Extract All”. After the file is extracted run the installer file. 5. Follow the wizard instructions to install SLM Utility-G4 on your PC. 6. Upon completion of the install, you will see the SLM Utility-G4 shortcut on your desktop. Connect the USB cable from the meter to the computer and turn the meter on. When using Windows XP, the Found New Hardware Wizard will appear. If prompted, do not search Windows Update for the driver. Select Install the software automatically. When using Windows 7 and 8, the driver will install automatically. It can take several minutes for the driver to install. lost. Using SLM Utility-G4, save any data or setups you have in the meter before upgrading. 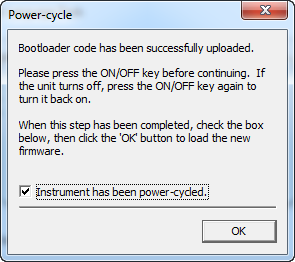 Warning: Loss of power during firmware upgrade may leave the instrument inoperable. As a consequence, leave the sound level meter connected to the PC and don’t remove the cable until loading new firmware has completely finished. Note: If you are using an 831-INT-ET docking station you will also need to update its firmware. If you upgrade the 831 by connecting through the 831-INT-ET docking station, the 831-INT-ET firmware will be updated automatically. Click File > Upgrade Instrument. Connect to the meter and follow the on screen instructions until you reach the screen where the firmware file is selected and ensure that “Upgrade the firmware using a .ROM file” is selected. 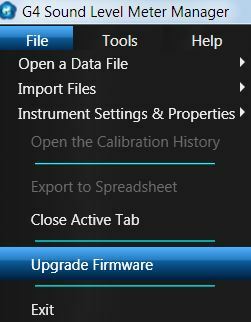 Click the Browse button and select the firmware file appropriate for your instrument (either the 831 or LxT file); click Open. 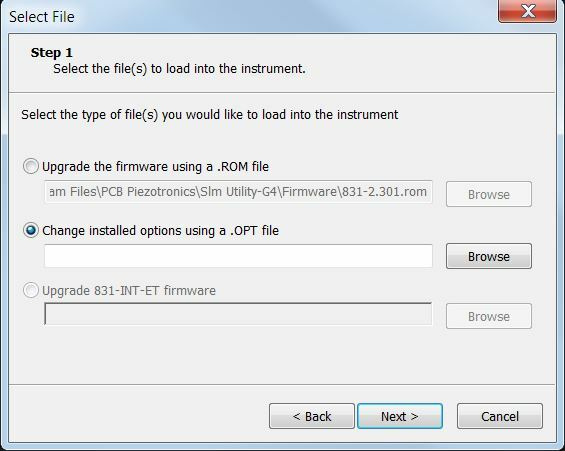 Follow the wizard instructions to complete the firmware upgrade process. 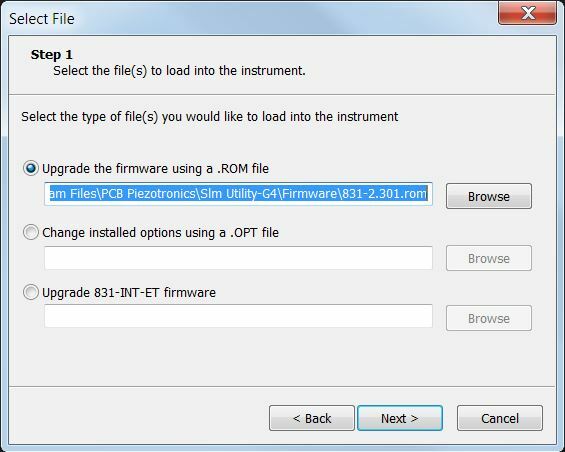 Follow steps 1 and 2 of the instructions for upgrading firmware rev. Select “Change Installed Options using a .OPT File” checkbox and browse to the location where you have stored the .OPT file. 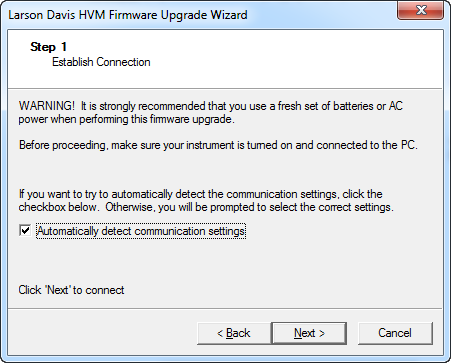 Follow the wizard instructions to complete the new firmware option installation process. NOTE: An options file is linked to the serial number of an instrument and is typically emailed to you after order placement, Make sure the meters serial number and .OPT file serial number match before continuing. While instrument is booting and the banner icon is in the middle of the screen, press and hold Stop, Reset and Enter simultaneously for 5 seconds to reformat the internal memory. Why can I not connect to a meter when Using SLM Utility G4 or G3? If SLM Utility G4 (any version) or SLM Utility G3 version 2.300 or later is unable to connect to a sound level meter, there are two potential causes. 1. To check for the correct driver click the start icon and in search type device manager then press Enter to start the device manager. a. Open the Charms Bar by dragging the cursor to top right of the screen or by pressing Win + C.
b. Select Settings and then Change PC settings. 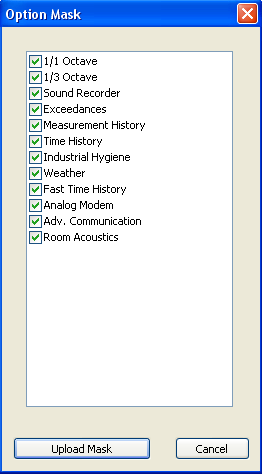 c. Select the Devices under PC settings application. 2. Using a USB cable, connect the sound level meter to the computer making sure the meter is powered on and fully booted. 6. If the driver manufacturer is “libusb 1.0” and you cannot connect then proceed to Cause #2. 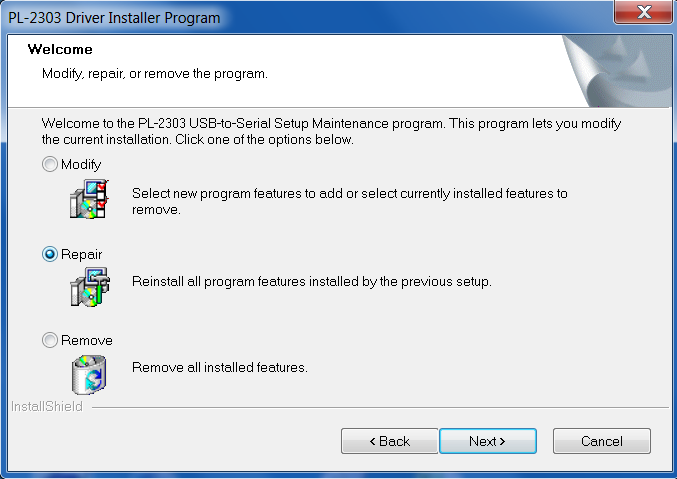 If the driver something different like motusb.dll then uninstall the SLM Utility G3 and/or G4 software then reinstall. Make sure that you install by running LDsetup.exe and that you have administrator rights. This problem only occurs when using a USB 3.0 port with drivers from certain hardware manufacturers. a. If the internal portion of the connector is blue, the port is USB 3.0. 8. 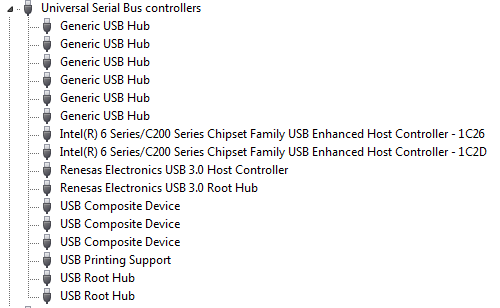 If there is a Renesas Electronics USB 3.0 device or device manager shows a device that is unknown and doesn’t have a driver, the USB 3.0 driver needs to be updated. This driver is provided by the manufacturer of the PC or motherboard. Normally, you can find the driver with instruction for updating if you google the manufacturer and model of the PC + USB 3.0 driver. 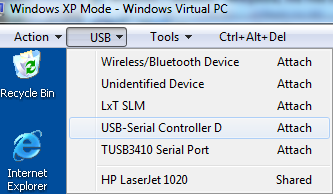 For example, I would google Lenovo T420s USB 3.0 driver. 9. Follow the manufacturer’s instructions for updating the driver and you should now be able to connect. If a workaround is needed, any available USB 2.0 port will work. What is the difference between the Model 831, SoundExpert LxT and SoundTrack LxT? What are the 831 and LxT key functions during instrument boot up? Why does the sum of filters not always match the overall reported level? 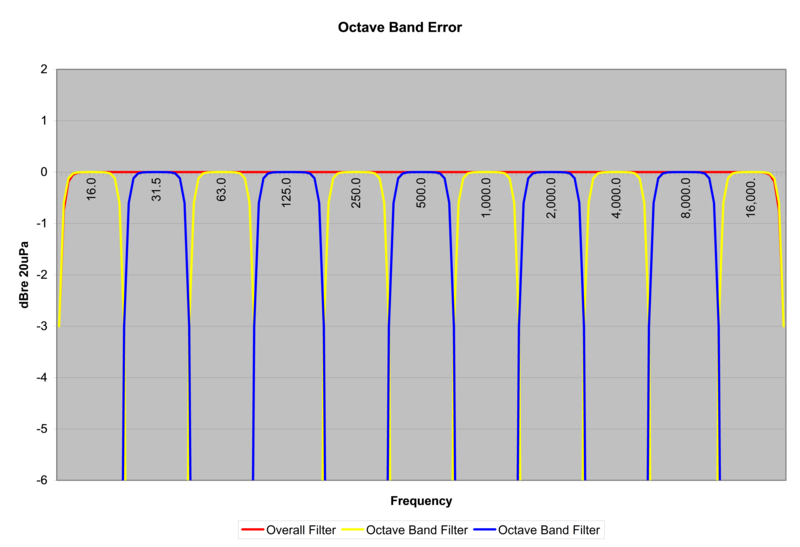 This means that when adding up the 1/1 and 1/3 octave bands, the frequencies at or around the cutoff frequencies of the filters will have a slight error. This is why these numbers can not be used to accurately calculate the overall sound pressure level. Even more error is seen when performing a Weighting after Filtering, as seen below. 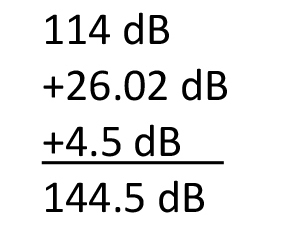 So if a frequency is close to the cutoff, the attenuation applied by simply subtracting it from the 1/1 or 1/3 octave band may be off by as much as 15 dB off. This creates an even larger difference between the Overall Level and the 1/1 and 1/3 Octave Sum. How can I temporarily disable purchased options on my 831 or LxT? 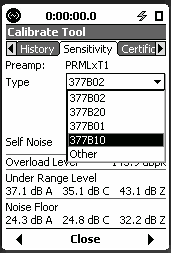 Using the SLM Utility-G3 you can “mask” installed firmware options to simulate other instrument configurations. 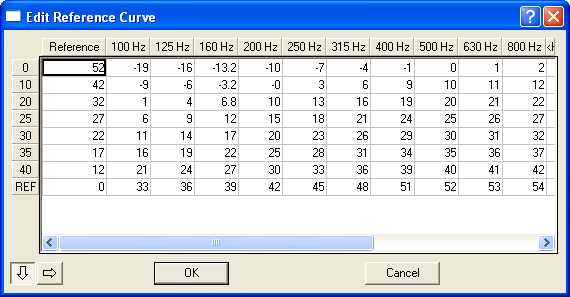 The mask can also be controlled on the instrument in tools -> System Properties -> Options tab. This is a handy tool for customer demonstrations or technical support, when you wish to configure an instrument with certain options. Here is how you do it. In the System tab, select Mask Installed Options. This leads to the following screens where you can, for example, uncheck flags to have only LOG + OB3 + SR.
Close the window, disconnect G3, turn off the 831 and reboot it. When you reboot and reconnect to G3, check to see that the MH / ELA is turned off. Re-establish the options with the reverse procedure or a “Format/Restore Defaults”. This will enable all purchased options. How can I get my instrument calibrated quickly? Product will be returned to customer as specified on the order. For a quick return, be sure to specify a fast shipment method. 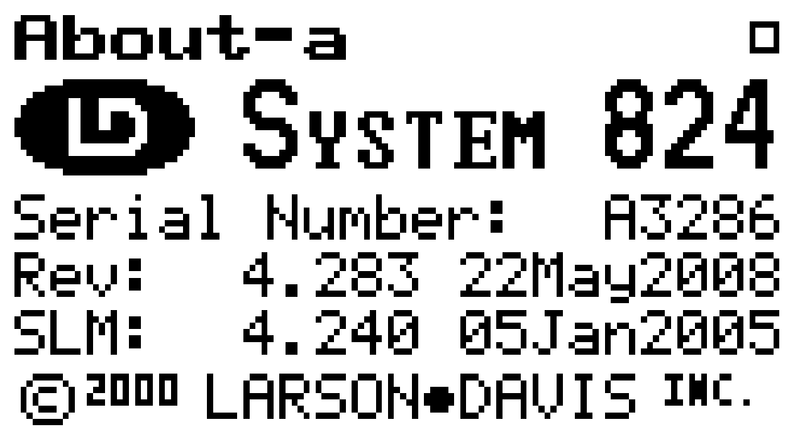 What operating system will run my Larson Davis software? 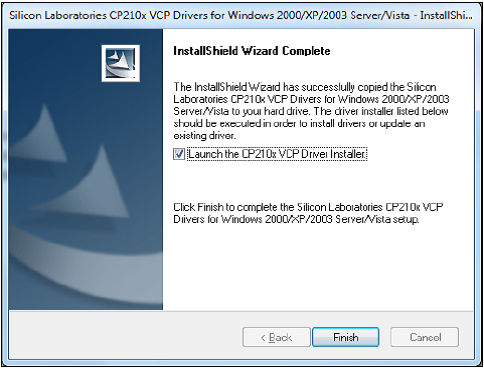 Some software requires a library from Microsoft, VC Redistributable, to be installed prior to installing the Larson Davis software. 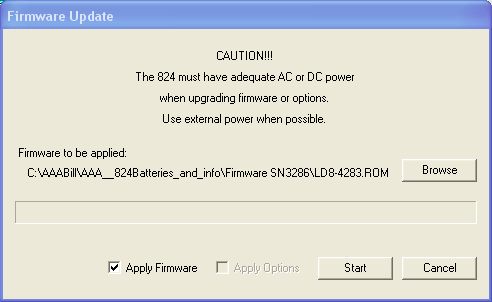 When using Windows 8, the user is required to reboot the PC after installation of this software component. When prompted to reboot, select yes. Failure to reboot will cause an SLMserver.dll installation error to occur although a reboot will clear this up. After rebooting, the installation will automatically restart and finish. XP mode is not available for Windows 8 but there are other, third party products available to create a virtual PC if support is needed for old software like SLM Utility (812/820). One such option is Virtual Box, https://www.virtualbox.org/ , that is available for free. Once virtual box is setup, then a legal copy of Windows XP still needs to be installed. Which unsupported operating systems are known to have problems and not work? 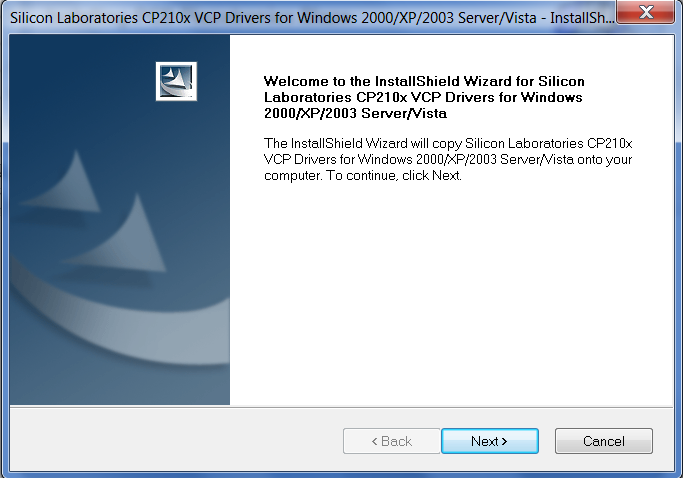 After starting the Virtual XP machine, you must install the XP version of the driver for the DVX008A. How do I get my Larson Davis product calibrated? Follow these instructions to return your Larson Davis product for factory calibration. B) We will attach a sticker to the product(s) showing when the item was calibrated and when the next calibration is due. As part of our ISO 17025 accreditation, the equipment owner must tell us when the next calibration is due. Please specify the calibration due date in order to avoid delays while we ask for this information. The due date can be a specific date or something like “in one year” or “in two years”. Larson Davis recommends factory calibration once per year. Note: Expedited calibration is available for an additional cost. Please contact us for more information. How do I install Blaze Software and Infrared Interface Drivers? Make sure you have full administrator rights before starting the installation process, otherwise the drivers will not install correctly. For the example above you would select for this computer. Click and Save As to your Desktop or where you would want the file stored. You will find this icon on your Desktop. All instrumentation that is connected to the computer must be disconnected prior to installing Blaze. 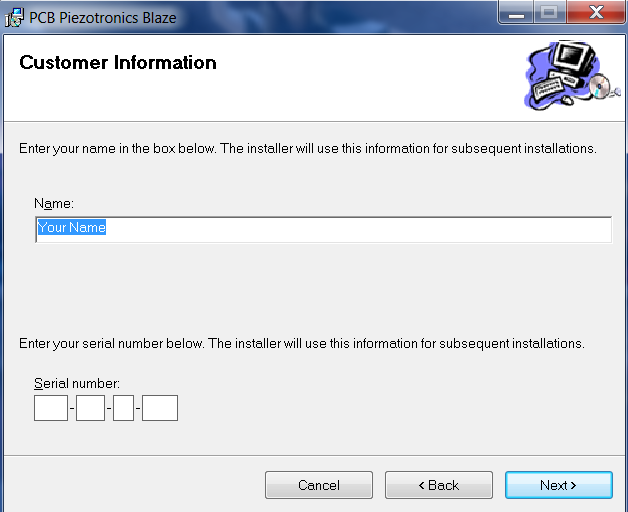 To install Blaze Software and drivers double click on the extracted setup.exe file (Application). Prompts to install DVX009 and DVX010 drivers, click Yes. Software from Silicone Laboratories will appear, follow the prompts and continue through the installation process. If this appears in the install, you may have had an Infrared (IR) device previously installed on your computer. Click option Repair then click on Next. You may be asked to restart your computer DO NOT restart your computer when asked during the IR download. The Blaze install is still not completed. You can restart your computer manually after the Blaze install is completed. 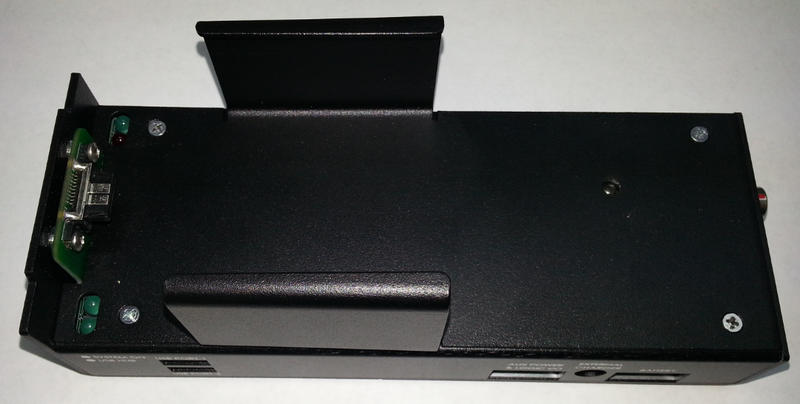 After Blaze is installed, plug in the InfraRed (IR) interface (DVX009 or DVX010) into the USB port. Allow the computer to automatically install the driver. 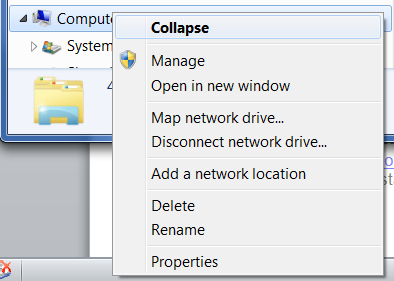 (If a prompt appears and asks to have you let the computer search Windows Update for the driver, click CANCEL, this is a very long process and the Blaze software will automatically recognize the driver and install it). Once the driver has been installed, it will show that the driver software has been installed successfully. Remember what COM Port the device is specified at for when you open Blaze as you may need to specify the COM port your InfaRed (IR) devise is located at. How do I upgrade the firmware on my HVM100? This FAQ outlines the procedure for using Blaze Demo to update HVM100 firmware to version 1.33. Do not disconnect power while reprogramming firmware. This can render the HVM100 inoperable and require factory service. 5. 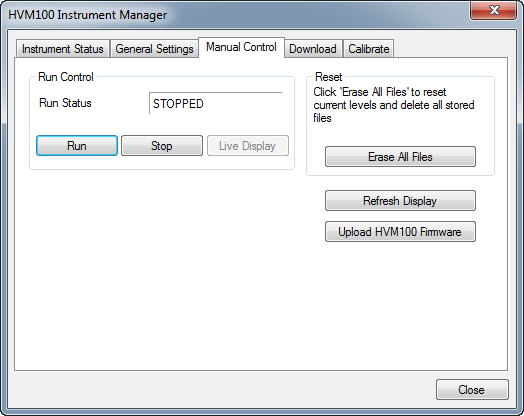 In the HVM100 instrument manager, select Manual Control then Upload HVM100 Firmware which will start the firmware upgrade program. 8. If the HVM100 is found, a menu with language options will appear. If the HVM100 is not found, verify the CBL006 is connected and the assigned COM port is less than COM14. NOTE: YOU ARE NOT DONE - KEEP THE HVM100 CONNECTED. 10. Once the message below has been displayed the firmware upload is complete and by pressing the on/off button the HVM100 will resume normal operation. How do I prevent trouble in the field when using Spark dosimeters? 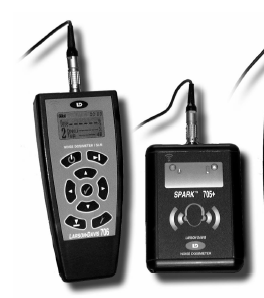 The Larson Davis Spark® Series multiple dosimeter system usually consists of the 706RC Dosimeter Remote Controller / Sound Level Meter and multiple 703+ or 705+ Personal Noise Dosimeters. NOTE: For the duration of the troubleshooting guide, the text, to avoid duplication, will only refer to the 705+; however the 703+ functions are identical to that of the 705+ and all recommended suggestions apply. 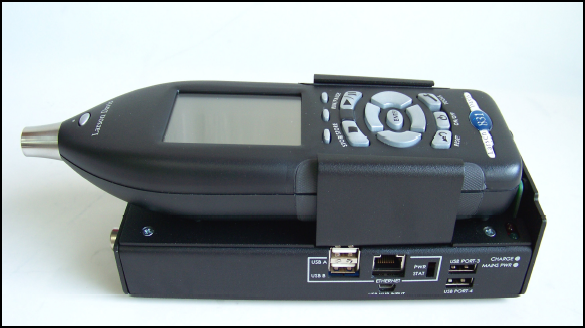 The 706RC has an LCD Display and a keypad for controlling and reading out data from the 705+. 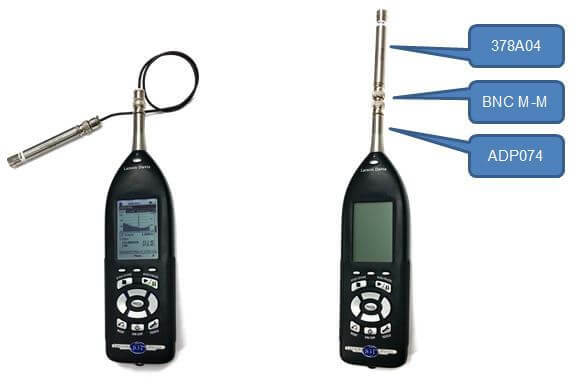 Use of these devices to obtain and report worker noise exposure data is usually straightforward and relatively simple, however, as with any system, unusual circumstances may result in actual or perceived fault conditions. The purpose of this document is to help guide you though any anomalous conditions or behaviors which may prevent the proper calibration and use of the system in the field. Power Up Mode: Unit is being powered after having the battery removed for an extended period of time. This is indicated by a simultaneous illumination of both the green status LED and the red power LED. This mode may last from 1 to several seconds depending on the amount of memory which is already being utilized for data storage in the dosimeter. Awake Mode: Unit has been awakened by the ‘connect’ command issued by the 706RC and is ready for calibration, measurement and calculation of data values. Power Critical Mode: Unit has virtually no battery capacity remaining and cannot perform any function. This is indicated by a single illumination of the red power LED every ten seconds. 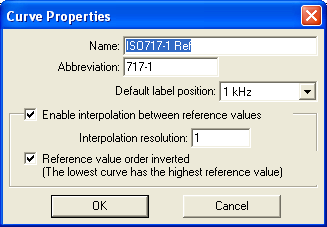 Envelope Icon: Indicates the 706RC is communicating with, controlling and receiving information from the 705+. All information viewed on the 706RC display is coming from the 705+ dosimeter while the envelope display is flashing. Probable cause: Dosimeter must be stopped (from taking data) and reset before Calibration can take place. Recommended fix: Press ‘Check’ key to erase error message, then press RUN key once, then press RESET key three times until you see “▼ Reset Overall? YES NO” Press Check key once, then press the TOOLS key to return to Calibrate screen. Proceed with Calibration as normal. Probable cause: a. Calibrator is not turned on, b. microphone is not placed in the opening of the calibrator, c. calibrator output is incorrectly selected, or d. microphone not connected or is malfunctioning. Recommended fix: a. Press round ‘ON’ button on side of CAL150 calibrator to turn it on. (see Fig 2). Note: calibrator will turn itself off after 90 seconds in order to save battery power. If calibrating multiple dosimeters, it may be necessary to press the on button again) b. Make sure the microphone is firmly placed into the opening if the calibrator adapter; there is an “O-ring” seal in the inner diameter of the calibrator adapter and this may require firm force to seat the microphone all the way into the adapter opening. c. There is a miniature slide switch on the calibrator housing (the same side of the case as the ON button). 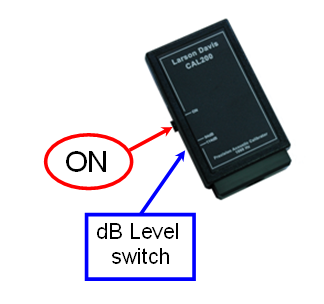 Make sure this ‘dB Level’ switch is in the “114 dB” position (pushed all the way towards the end of the calibrator which has the microphone opening. d. Make sure the silver microphone connector is fully seated in the mating receptacle in the top of the dosimeter. If it is fully connected and still indicating ! or ! LOW on the calibration screen, then the microphone is most likely defective and should not be used. To verify this, take a different microphone and substitute it for the malfunctioning and proceed with calibration procedure. If the calibration is successful then it is the first microphone which is at fault. Indicated by: Display prompt on 706RC is asking the operator to “first Stop and Reset” even though 705+ dosimeter is not running / no data are present. Probable Cause: Unit has had some interference and/or interruption of infrared control most likely caused by having multiple dosimeters in close proximity to each other while attempting communication or control by the 706RC. Recommended fix: Remove the battery from the dosimeter and set it aside for at least five minutes, then replace the battery and observe the dosimeter as it indicates it is going through the Power Up mode (see Glossary). This action will perform a complete system reset of the dosimeter – NOTE: you must check the date and time and reset it if has been changed back to the default settings (1/1/08 and 00:00:00) due to loss of power. How do I install firmware options into an HVM100? 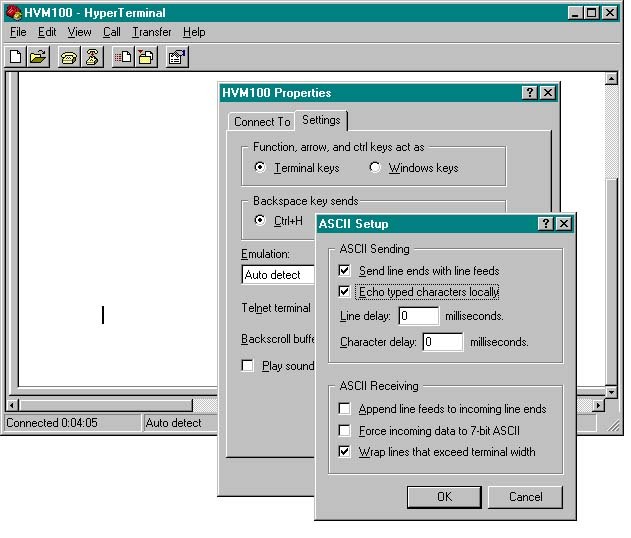 This document contains instructions on how to establish a Hyper-Terminal connection (serial port) with the HVM100. If you have already established this connection, skip to the command instructions sent with your serial number specific options. A. Turn on the HVM100 and set its baud rate to 115.2k. Connect the CBL006 cable to the HVM100's serial connector and to the PC's Com1 serial port. B. 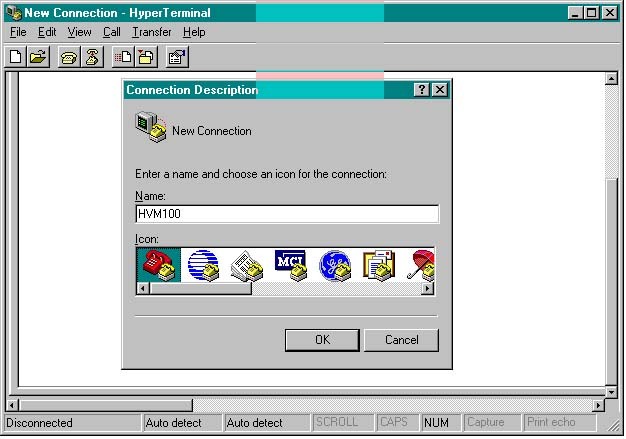 Use Window's Hyper-Terminal to establish connection to the HVM100. 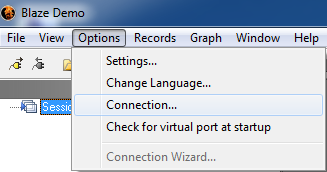 Hyper-Terminal is found in Windows by selecting "Start", then "Programs", then "Accessories", then "Communications", and then "Hyper-Terminal". C. Once Hyper-Terminal starts, you will be asked to "Enter a name and choose an icon for the connection:". 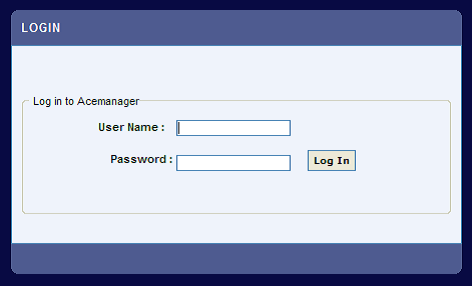 Type "HVM100" for the name, and select one of the available icons. Then press OK. See Figure 1 below. 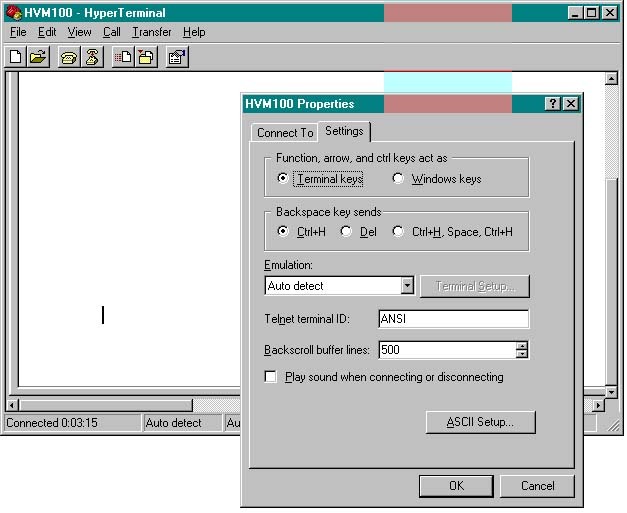 Figure 1: Type HVM100, select and icon, and press OK.
D. Hyper-Terminal will then open a window titled "Connect To". In this window select "Connect using: Direct to Com1", and then press OK. See Figure 2 below. 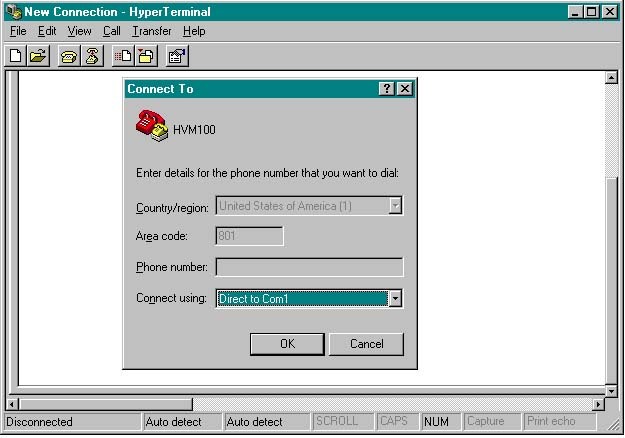 Figure 2: Select “Direct to Com1” and press OK.
E. Hyper-Terminal will then open a "COM1 Properties" window. Setup Hyper-Terminal as shown in Figure 3 below and then press OK. Figure 3: Setup the COM1 properties as shown above and press OK.
F. Next, from the main menu in Hyper-Terminal, select "File" and then "Properties". 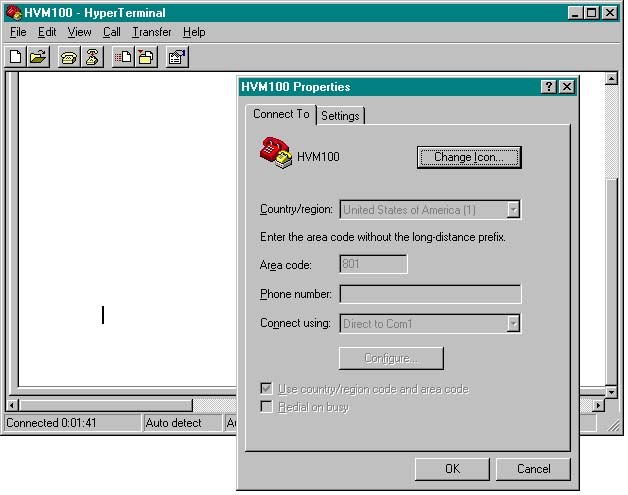 A window titled "HVM100 Properties" will appear. Select the Settings tab. See Figure 4 below. 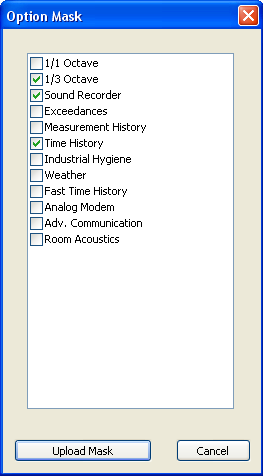 Figure 4: Select the “Settings” tab . G. After the “Settings” window appears, select the “ASCII Setup…” tab. See Figure 5 below. Figure 5: Select the “ASCII Setup…” button. H. After the “ASCII Setup” window appears, select the “Send line ends with line feeds” and “Echo typed characters locally” options. See Figure 6 below. Then press OK and then OK again to close both windows. Figure 6: Configure ASCII Setup as shown. Press OK (press OK again to close previous window). Once you have connected to the meter, type the commands given to you by Larson Davis to update you meter. Why can I not connect a meter when using SLM Utility G4 or G3? To check for the correct driver click the start icon and in search type device manager then press Enter to start the device manager. Open the Charms Bar by dragging the cursor to top right of the screen or by pressing Win + C.
Select Settings and then Change PC settings. 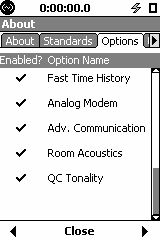 Select the Devices under PC settings application. 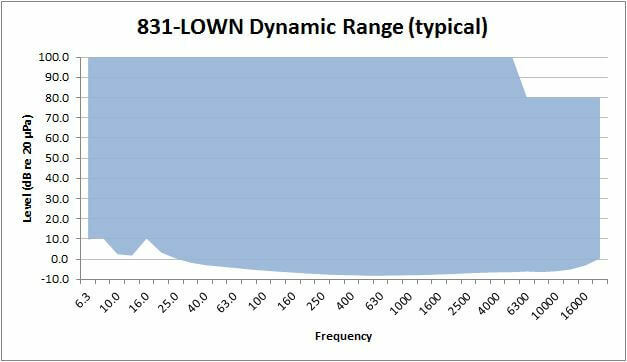 How do you use the Model 831 with the 378A04 microphone & preamplifier to measure low level noise? The Model 831 sound level meter can be used with the 378A04 low noise microphone & preamplifier to measure noise levels as low as 6.5 dB A-weighted. 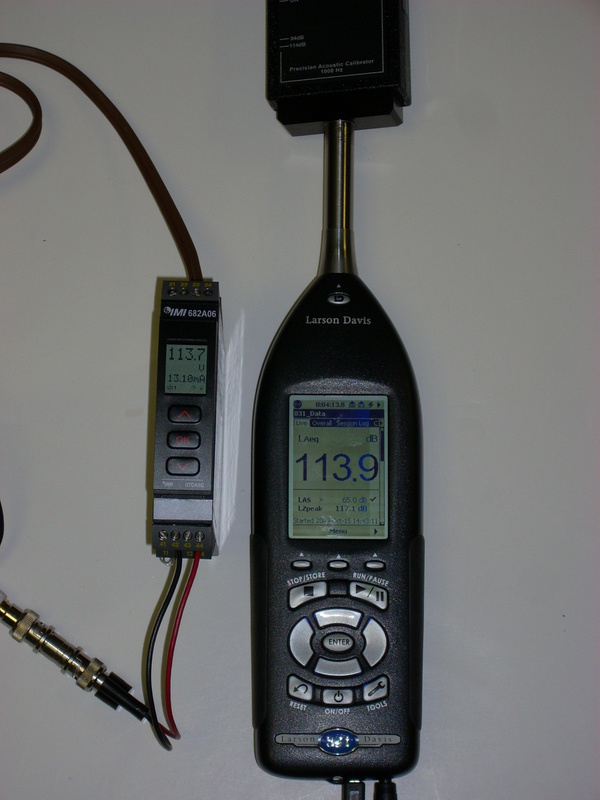 This FAQ describes the necessary equipment and procedure for setting up the Model 831 to make these measurements. A complete kit with all these items except the CAL200 can be ordered using part number 831-LOWN and an existing 831 can be upgraded using part number 831-LOWN-UPG. Fully assembled, the 831-LOWN system looks like the systems shown below depending upon whether the flexible BNC cable is used or the rigid connector. When using the 378A04 with the Model 831, the overload indication will not work properly because the 378A04 has less dynamic range than the Model 831. Measured levels above the Upper Limit documented below should be considered as overloaded. The table below documents the acceptable measurement range. 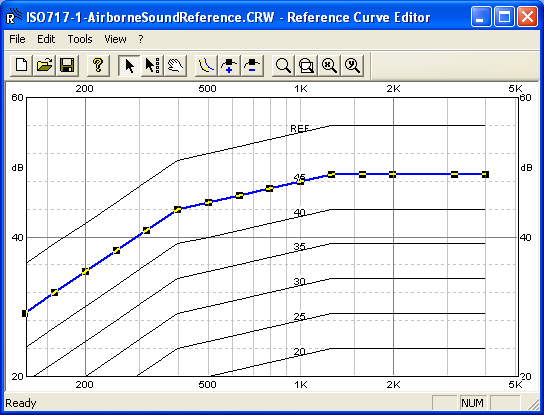 2The frequency dependent 3 % distortion limit is 80 dB for the entire frequency range and 100 dB from 10 Hz to 5 kHz. 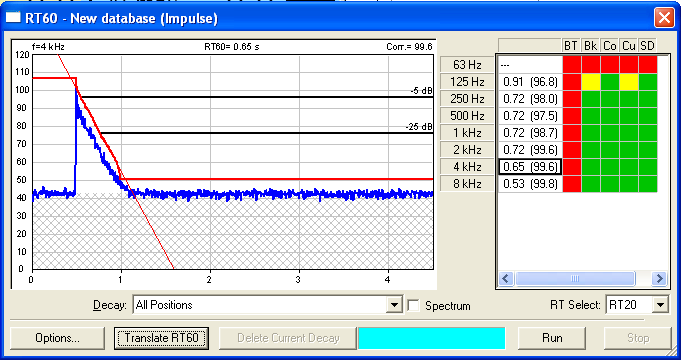 3The frequency dependent 3 % distortion limit is 60 dB for the entire frequency range and 80 dB from 10 Hz to 5 kHz. 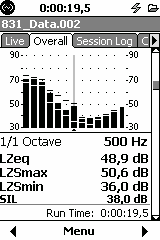 Spectral Statistics - The Model 831 records statistical distribution data (LN) between 200 and 0.2 dB. 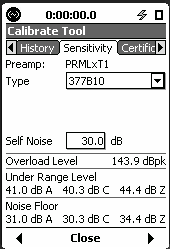 Statistics for levels less than 0.2 dB are not computed. This does not impact the broadband statistics but has potential to be seen in spectra statistics. Power and Battery - Using the 378A04 with the Model 831 will decrease the battery run time by approximately 15%. 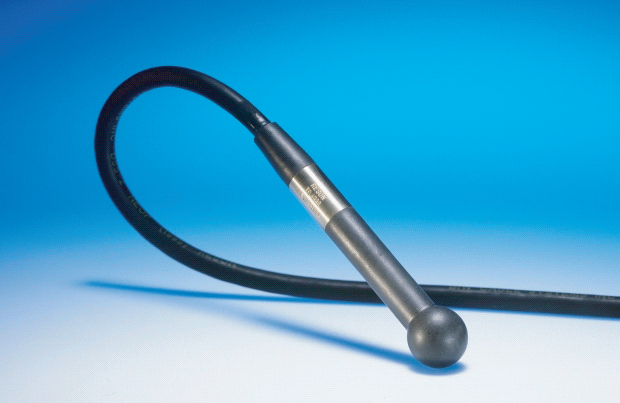 Standards compliance - The Model 831 sound level meter when used with the 378A04 low noise microphone has not been tested for compliance with IEC 61672-1 or ANSI S1.4. Larson Davis does not guarantee compliance with all the requirements of IEC 61672-1 or ANSI S1.4 when using the Model 831 with a 378A04 microphone. Because of the technology used to build the 378A04 it is not possible to perform an annual certification of the 378A04 using an electrostatic actuator, which is commonly used by calibration facilities. For this reason, annual calibrations should be performed at the factory in an anechoic environment. Contact Larson Davis for price and lead time information.